Trumpeter’s massive rollout in 1/32 scale continues…I won’t bore you with the details. Lots of kits, lots of work, lots of fun. 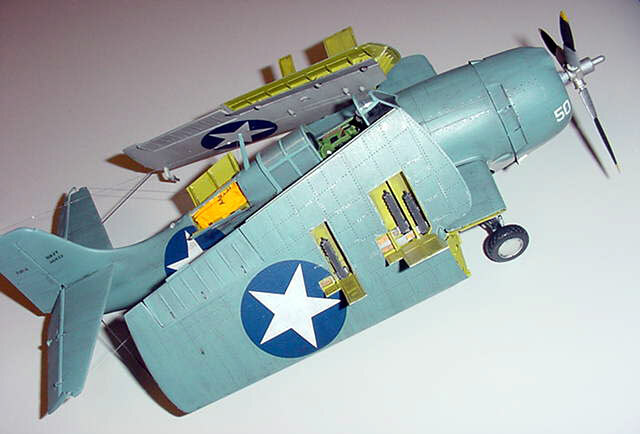 Trumpeter’s F4F-4 Wildcat is, in my opinion, quite a challenging build. It is an ambitious kit, with working control surfaces (everything but the trim tabs), folding wings, and very good detail. 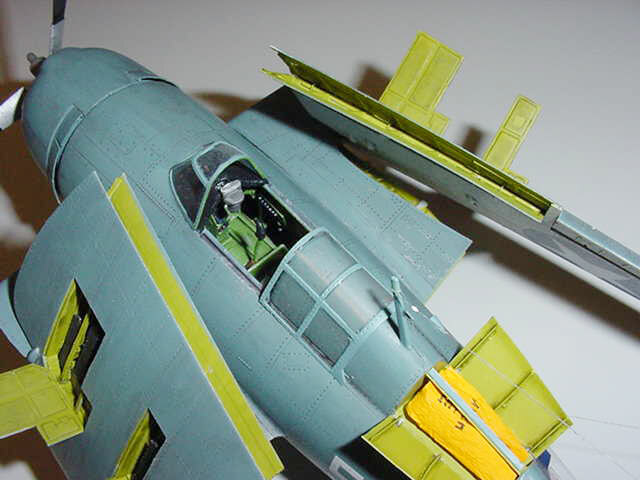 Very tight fit of the forward fuselage halves around the cockpit….I think the front of the ‘pit is a bit too wide. The seat is too thick, you’ll need to shave it down or replace it with a brass one. Rubber tires . Uuuugghhh! ‘Nuff said. Hey Cutting Edge! How about some resin here? Lots of openings to mask. A treasure trove to the superdetailer, a nightmare for those who hate spending several nights masking. You’ll need that whole roll of tape. 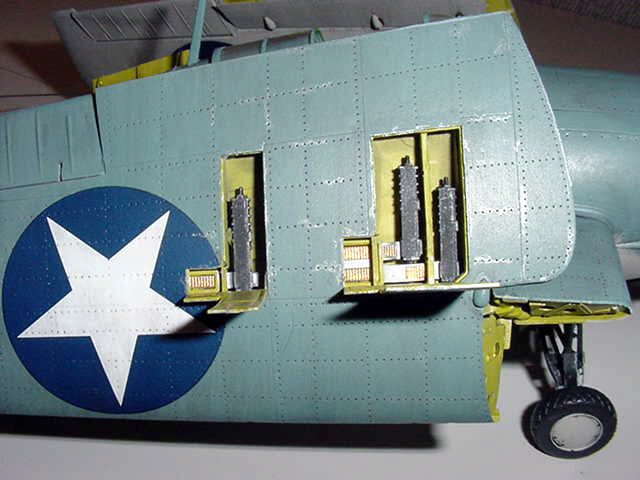 The access hatch on the starboard lower rear fuselage sticks way out (about 3 scale inches) from all that nice recessed panel line and rivet detail. I cut mine open, which of course necessitated scratchbuilding an interior and filling more &*^%$#@ ejector pin marks. While some may like the option of moveable folding wings, the fit in the extended position is far too loose, so the outer panels hang down like a cruising albatross. Be prepared to glue your wings in one of the positions so they will line up correctly. Glue those *&^%$# photoetch hinges tight. The kit gives you open bays for all six “fifties”, a little detail inside the gear bay (the gear retraction chains are not convincing, but they are also hard to see), and a very nice engine. The cowling is a one-piece clear affair, but I hate that, so I painted mine. Cockpit detail is very nice with separate control consoles, bulkheads, a nice control stick, and Trumpeter’s trademark plastic instrument panel with film instruments. No seat belts or hardware are included. The canopies are thin and very clear with nice relief on the framing. A scratchbuilt opened life raft compartment. This feature was deleted on later F4F’s because it was found that the bird usually sank so fast on ditching that the pilot had no time to deploy the raft! My raft is painted and white-glued tissue paper. The kit also supplied two drop tanks, but I think they destroy the lines of the plane visually (they look like a big pair of …..never mind) so I didn’t use them. Paint is my usual Polly Scale Acrylic, this time USN Blue-gray over USN Light Gray, with a watercolor wash and Testors Acrylic Clear Flat. Chipping was with a Prismacolor silver art pencil. The only markings provided are for Joe Foss’ Guadalcanal bird, but they laid down nicely. I had to use a bit of setting solution on the fuselage stars to get them to fit the compound curves, but they behaved well. 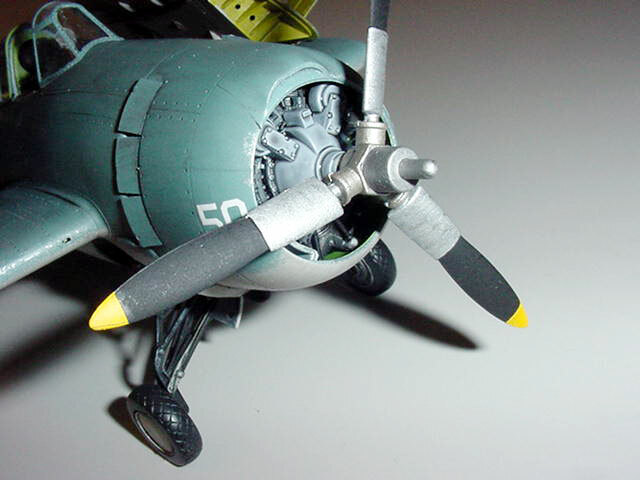 Now, somebody….how about an FM-2 conversion, hmmmm?